I was treated to a private skin consultation by Jan Marini last month to discuss my skin and the various concerns I still have with my face since ending Accutane two years ago. We talked about my struggles with acne from a young age and how I wish to treat the acne scars that linger on my face today. She gave me powerful insight into the world of skin care. Jan Marini is known for creating innovative beauty products to combat acne and fight it for good. I was lucky enough to be gifted a few of her skin care products to test out for myself. After just a month into using the line, I am already impressed. We discussed the skin care products I currently use on my face and I was thankful to switch over to her line with great success. As someone who has struggled to find the perfect formulas to treat her acne, I was hesitant to put anything new on my skin. Often times when I switch up my products my skin can have a bad reaction and start to flare up. I took the Jan Marini products to my bathroom once they arrived at my door. I had brand new tools to keep my skin acne-free! I knew I could trust Jan as soon as she started talking to me about the technology behind each of her products. 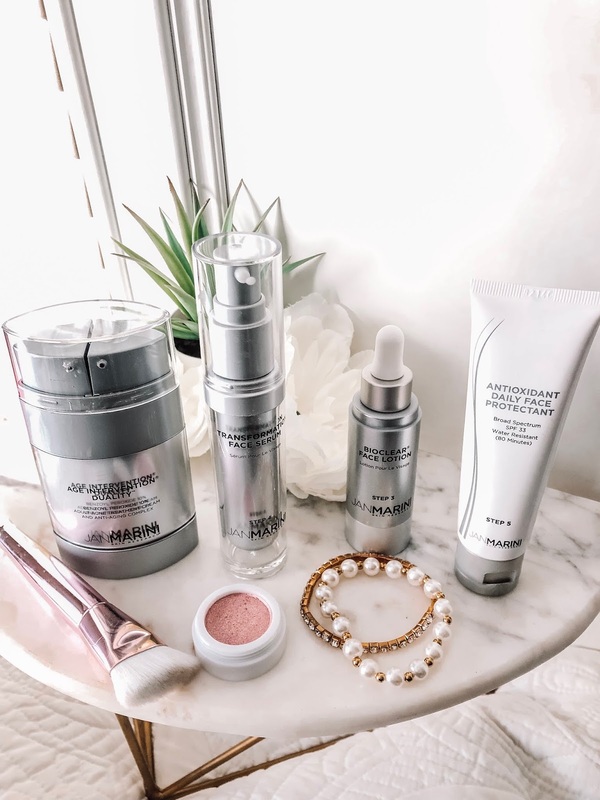 She works with experts to design the best line of skin care to treat every skin problem, from stubborn adult acne to fine lines. 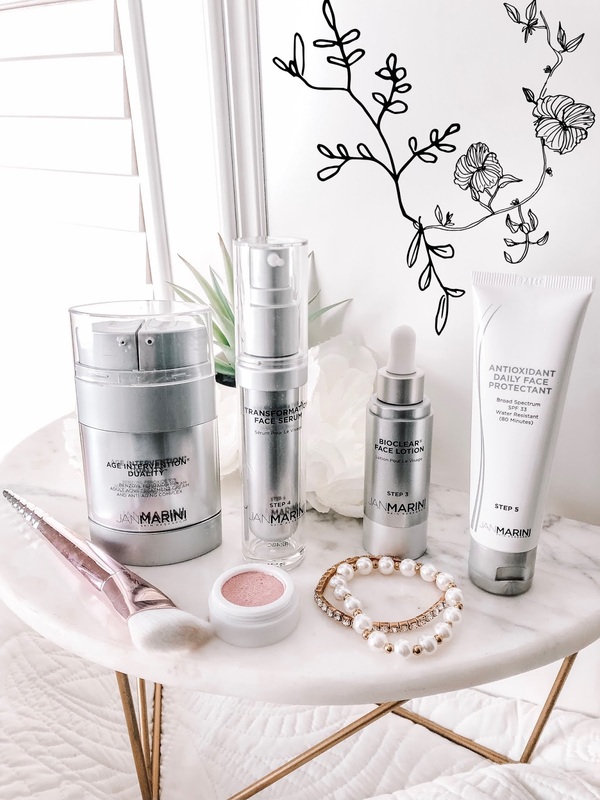 From the Jan Marini brand, I was gifted a few key products to add to my morning and night routines. To cleanse my face, I started using the Bioglycolic Face Cleanser morning and night. What shocked me the most about using this product is how you don't use it with water! That was hard for me to understand at first, but now it doesn't bother me to wipe off the product with a warm washcloth instead. Glycolic acid works to remove dead skin cells and reveal a softer appearance on the skin. The cleanser is also creamy and non-irritating. After cleansing, I apply the Age Intervention Duality lotion to my clean face. This product is by far the BEST one yet. It's crazy to believe that I am using a product on my skin with the dreaded benzoyl peroxide again. I tried using benzoyl peroxide YEARS ago with little change to my skin. However, on my call with Jan, she assured me that this product has the perfect balance of ultra-micronized benzoyl peroxide and retinol to combat serious acne. Using a formula with 10% benzoyl peroxide, green tea, hyaluronic acid, and retinol is the perfect combination to treat acne! I also added the Bioglycolic Bioclear Lotion into my daily routine. For tackling my larger acne scars, Jan suggested this product to me. I apply this lotion to my skin at nighttime. The lotion will provide my skin with multiple ingredients to target the uneven texture leftover from years of acne. Another one of her products that I already LOVE is her sunscreen. Just the smell of the sunscreen alone makes me enjoy putting it on each morning before doing the rest of my makeup routine. The Antioxidant Daily Face Protectant SPF 33 offers UVA and UVB protection with oil control in one tube. It's not sticky at all and will be great under your makeup, too. I also make sure to use this sunscreen on my arms and neck! When using other products that contain benzoyl peroxide and retinol, it's VITAL to use sunscreen. Those ingredients can make you sunburn more easily, which is why you need to add sunscreen into your daily routine. This post is sponsored by Jan Marini and Brandbacker. All opinions are my own!